The answer to why digital recordings retain their quality longer lies in the bivalent nature of digital data, being comprised of either "high" or "low" states, with nothing in between. Consider a sine wave, directly recorded in analog form on magnetic tape, versus a digitized representation of a sine wave, recorded as a series of 1's and 0's on the same type of tape. Now introduce some "noise" to each of the signals, and consider the results upon playback. In particular, explain why "RAM" is a misleading term. Technically, RAM means Random-Access Memory, where data stored in memory may be accessed without having to ßift through" all the other bits of data in sequential order. 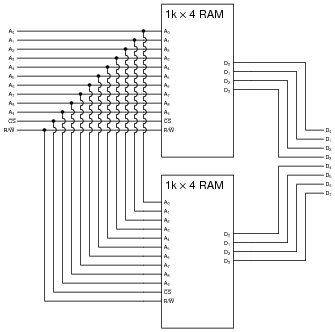 In practice, however, the term RAM is used to designate the volatile electronic memory inside a computer, which just happens to be randomly accessible. The mis-use of the acronym "RAM" is another unfortunate entry in the lexicon of electronics. Your students are sure to have questions about this term, so be prepared to discuss it with them! One of the purposes of this question is to get students to realize that "RAM" memory (solid-state, volatile memory "chips" in a computer) is not the only type of data storage device capable of randomly accessing its contents, and that the term "RAM" as it is commonly used is something of a misnomer. Explain the difference between static RAM ("SRAM") and dynamic RAM ("DRAM") memory technologies. Which type of memory technology provides faster access of data, and why? Which type of memory technology provides the greatest storage density, and why? Follow-up question: how is refreshing provided for dynamic RAM chips? Is this something taken care of internal to the chip, or must the circuit designer provide external circuitry to refresh the dynamic RAM chip's memory cells? Flash memory is a nonvolatile memory technology, offering greater density than either SRAM or DRAM, and faster erasure than standard EPROMs. At first, it would seem Flash memory outperforms all other memory types, but it doesn't. What are some of the disadvantages of Flash memory, and what kind of applications is it best suited for? I'll let you research these terms on your own! There are many technical references available on digital memory technology, so finding definitions for äddress" and "data" should not be difficult. Analogies are often helpful to communicate the concepts of äddress" and "data" to new students. I like to use the example of post office boxes (lots of addressed boxes, each containing different items) when I explain address and data. Discuss with your students why there are not 4000 (exactly) addresses in a "4k" memory chip. Follow-up question: a common mistake made by students when they ëxpand" the data bus width of a memory array is to parallel the output lines (in the same way that the address lines are shown paralleled here). Why would this be wrong to do? What might happen to the memory chip(s) if their data lines were paralleled? Be sure to spend some time discussing the common mistake referenced in the follow-up question. This is something I've seen more than once, and it reveals a fundamental gap in understanding on the part of the mistaken student. What students are prone to do is try to memorize the sequence of connections rather than really understand why memory array expansion works, which leads to errors such as this. Note that the answer to "what might happen" depends on whether the first operation is a read, or a write. Challenge question: as you can see, the expansion in addresses comes at the expense of losing the ability to simultaneously disable both memory chips. Add whatever logic gates are necessary to this circuit to provide a "global" [`CS] line for the 2k × 4 memory array. Be sure to spend some time discussing the follow-up question. Once again, I've noticed students are prone to memorizing the connection pattern rather than take the time to figure out why the chips are connected as they are. 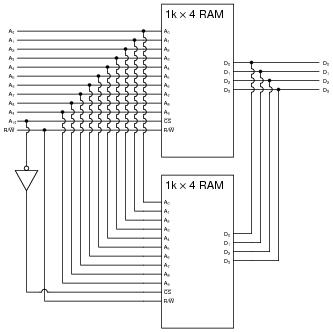 Use four memory chips: parallel the ten address lines from each 1k × 4 memory chip, then connect the [`CS] line of each chip to the output of a 2-line to 4-line decoder. The two decoder input lines will then become address lines A10 and A11 of the 4k × 4 memory array. Follow-up question: explain how the memory chip "knows" which 12 bits of the address are being read at any given time. An important use for read-only semiconductor memories is as look-up tables. Describe what a "look-up table" is, and what one might be used for. An example of a look-up table is an EBCDIC-to-ASCII code converter, where an EBCDIC code input to the address lines of a ROM chip "looks up" the equivalent ASCII character value from memory, and outputs it as the result through the ROM chip's data lines. The EBCDIC-to-ASCII code converter concept is not hypothetical! I actually designed and helped build such a circuit to allow standard personal computers to "talk" to an obsolete CNC machine tool control computer which didn't understand ASCII data, only EBCDIC. A look-up table implemented in a UVEPROM served as a neat way to implement this function, without a lot of complex circuitry. EPROM would probably be the best choice. I'll let you discuss this with your classmates and with your instructor, though! This question is multi-faceted. Students must consider volatility and ease of updating (the data), as well as simply applying the concept of a look-up table to a car's engine control computer, in order to intelligently answer this question.